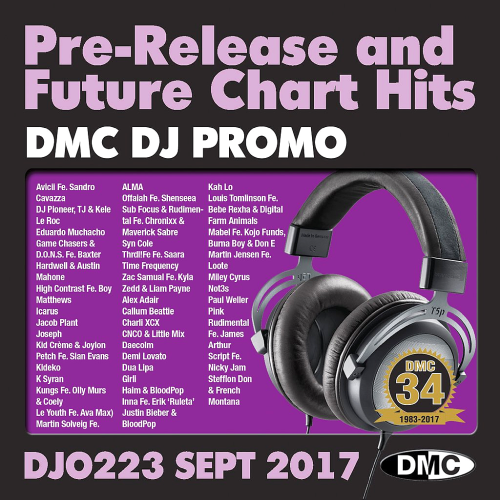 Date: 1.03.2018 | House, Electro, Dance, Dubstep, Disco, Reggae | Tags: DMC DJ Promo, Chart Hits, DMC Records, Zedd, Joylon Petch, Jacob Plant, Dua Lipa, Bloodpop, Louis Tomlinson, Rudimental, Stefflon Don | Download DMC DJ Promo 223 - Future Chart Hits September (2017) for free. Rising London pop star Girli is back with an unapologetic new for her song Hot Mess.The artists latest has her taking on the patriarchal music industry accompanied by her girl gang of skaters known as the Bowl Babes. Back To You is his first solo single and convinces with harmonic vocals, good beats and perfect features like Bebe Rexha and Digital Farm Animals. More Mess is a song performed by DJ and record producer Kungs, featuring vocals from English singer Olly Murs and Coely. New Rules is a song by English singer Dua Lipa from her eponymous debut studio album. Kah-Lo is the Nigerian-born rising star, who has enjoyed an incredible with a chart-topping hit with Rinse & Repeat; her infectious collaboration with London-based producer Riton. DJ Promo 223 Pre-Releases and future Chart Hits Release.